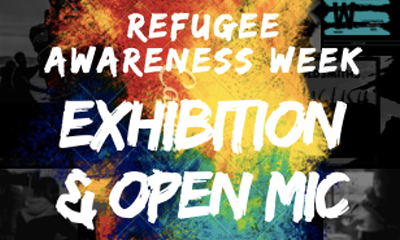 To round off their celebration of Refugee Awareness Week Goldsmiths English PEN are holding an exhibition and OpenMic night including a reading from Sudanese poet Al-Saddiq Al-Raddi. Participants from their Poetry & Pizza night back to share the creative pieces that have emerged after exposure to refugee writing. They encourage all kinds of creative expression, ranging from dance to poetry, art to drama; anything that celebrates and explores the intricate nature of the genre. Whether explosive and starkly honest, or soft and liberating, the aim is to tap into our emotions regarding the crisis and stir up enough collective passion to continue doing something about it. The night will conclude with a brief explanation about how to get involved with volunteering/donating/fundraising in both the UK and abroad, and of course, a huge celebration of the talent we’ve experienced throughout.